MILAN — Still smarting from controversial refereeing decisions and troubled by impending new financial fair play sanctions, AC Milan is preparing for one of its most crucial games of the season this weekend. Milan hosts Lazio on Saturday in a match that could prove important to both teams' Champions League hopes. 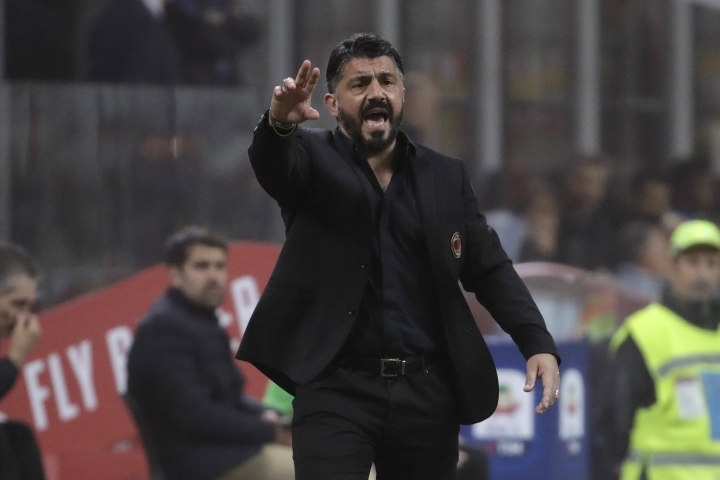 "The match is still worth only three points, but Lazio has a game in hand and we could end up tied in fourth place," Milan coach Gennaro Gattuso said. "It's a vital match, it's like a final, and we must take home all three points if we want to stay in the Champions League race." Still, Milan was left fuming at perceived unjust refereeing decisions, with the focal point of its ire a penalty that was not given despite Alex Sandro stopping Hakan Calhanoglu's cross with one of his arms. After reviewing the play, referee Michael Fabbri decided it was involuntary. 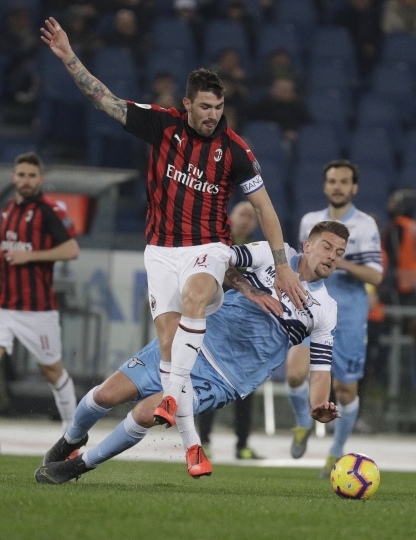 "The meeting we had with the referees was very positive," Milan captain Alessio Romagnoli said. "We had the opportunity to speak directly to the referees. These meetings are important to clear any doubts. ... Referees make mistakes just as we players do. We're all human. "It's all in the past now. We have to focus on playing football and winning games. There are seven matches left, one against a direct rival, a very strong side, and we have to build on our performance against Juventus and get the three points. ... We have to play a great game to bounce back." Milan's opponents have taken advantage of its poor results to gain some ground, but Lazio has not. It blew two chances last week to move into fourth, losing 1-0 at relegation-threatened Spal before a 2-2 draw at home to Sassuolo. Qualifying for the Champions League is crucial to Milan's finances and would help it avoid further FFP sanctions from UEFA. The club has not qualified for the Champions League in five years and UEFA announced on Wednesday that it is again facing punishment for breaking FFP rules. "It's not a surprise," Milan director and former player Paolo Maldini told Italian television channel SportMediaset. "There's a weekly dialogue with UEFA. We are ready for anything. We have a lot of weapons. As a club, we don't want there to be a tough battle without dialogue." The latest case is separate from UEFA's judgment in December that fined Milan 12 million euros ($13.5 million) of Europa League prize money and threatened a one-season ban from European competition if it cannot break even on soccer-related business by June 2021. That case also included the Court of Arbitration for Sport overturning a ban in July that had been imposed on the seven-time European champions for overspending. It said that the one-year exclusion from European competition was too harsh considering Milan's recent takeover by United States-based hedge fund Elliott Management. "FFP has got rid of debts in European football but not allowing a healthy club without debts to go into the transfer market is also unconstitutional," Maldini said. "UEFA well understands that Milan is a healthy club with competent people."